A great question asked by the Master ! Especially for us corporate types …. 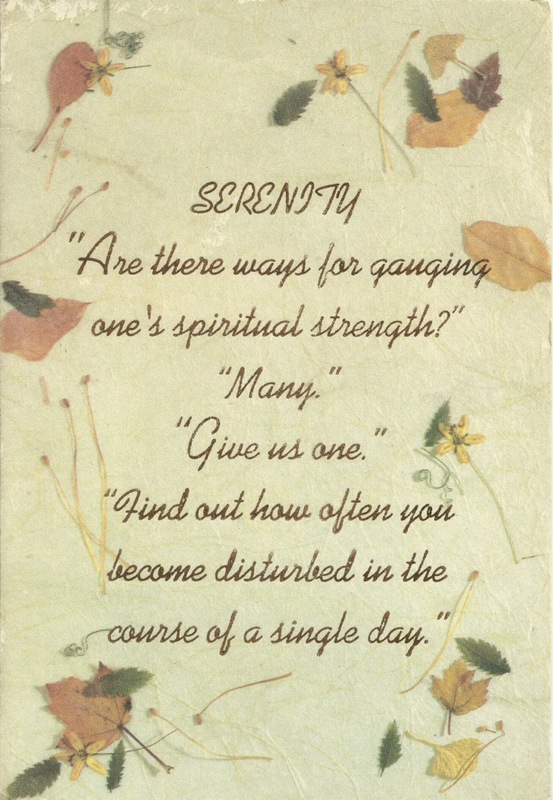 How often do you become disturbed in the course of a day ? Innumerable times, so often that we can’t count ? The deadlines, targets, politics, comparisons, money all adding up to the stress and “getting disturbed” situation. I get disturbed if I get late or someone else comes late for a meeting. I also get disturbed with the traffic, especially the two-wheelers in Bangalore as they try to get ahead from every direction. I get disturbed with stupidity. I get greatly disturbed when people are treated badly, when the organization process needs to be followed to remove a damaging colleague, my patience wears thin, while I can understand why we need those processes. I get disturbed when I see sycophancy and no recognition of good work …. And I can go on with my list as I am sure most of you can. But where does this leave us ? Harried, worried, with a myriad health issues, and broken relationships. Just play out a typical executive’s life – he wakes up to a blackberry’s alarm, reads the emails while still in bed, gets disturbed as he swings his legs off the bed as he sees the sales number achieved being less than the target, frowns at his wife, mindlessly gulps down his tea, gets a message from one of his direct reports that she is sick and not coming in, another message saying an important team leader has quit, then he goes to take bath, lathering on his soap, still getting all worked up about this team leader who has quit because he had specially sent her for two expensive training programs that year and now has to explain why he did that. As he is stuffing his breakfast into his mouth, he is on his first conference call and mimes his answers to his wife and children or puts the phone on mute and yells at her for asking too many questions. Starts driving while still on the call, gets through “heavy” traffic and has just completed his second call. Reaches his desk to find that he forgot his cellphone charger ! He is really upset and then asks around if anyone has his specific phone type charger plugs it in and smiles for the first time since he woke up. His laptop hopefully doesn’t choose this day to crash, so he is able to see his emails and there are just 200 of them, 100 of which is FYI and the rest need approvals and just a handful that need action. The day rushes by in a series of meetings, some important, some JLT (just like that), and he repeats his trip back home with another conference call on the go. Some dinner while absently watching TV, worrying about his boss’ remark at the third meeting about his performance and what impact it would have on his increment or promotion. His wife chatters on and the day ends. Feel free to swap the gender, some more stuff just gets added, like the child or children’s tiffin box to be packed, the bad marks they got in a subject, the sari for the family event, how much weight has gotten added and how much weight her friend has lost, PMS, hormonal imbalance, etc etc etc. Find a minute to atleast take a deep breath ? Seems tough, right ? Here’s where Swami Vivekananda’s quote comes in handy. Stop and reflect on how many times you get disturbed and through acceptance and the knowledge that you are the Buddha in the making, you can make a day, and your life serene. Serenity offers time to think, re-align, relax and take better decisions. So it’s not just for the monks and the religious folks to have serenity, it’s even more critical for you and I, who are in the marketplace to be serene. Decisions we take affects many lives, so it’s our responsibility to make good decisions and good decisions don’t come out of being harried !! Think of a serene, calm and collected you – the world suddenly seems a lot better and life seems a lot happier. Yes ?